After the liberalization of the Spanish energy sector in 1997, the functions of the actors involved in the energy market were separated – from the generation to the commercialization of energy to the final consumer. In this post we explain in detail the market functions and responsibilities of each of these actors. The kWh -the electricity- is not like any other commodity. A peculiarity that differentiates it is the need to have instantaneous clearance of demand and supply – in other words to always produce as much electricity as it is consumed (since it is not yet viable to store large quantities of kWh). But if we look at it from a more distant perspective, the market players of this product – for Spain, the Iberian Electricity Market “MIBEL” – are not so different from those of other markets such as the automotive, trade, financial etc… This market is supervised by the CNMC – National Commission of Market and Competition. In short, MIBEL is comprised of some players who produce the good (Producers) and others that consume it (Consumers); Between the source and the end-consumption there are several stages that intervene, such as: the control of production and the establishment of price (Regulators and Market Operators), the transport of the product (Transmission Operators), the distribution of the product (Distributors) and the sale of the product to the final customer (Marketers or Utilities). Surely some of you, if you replace the product “kWh” for another, say Vegetables, could identify and replace the actors named above ... 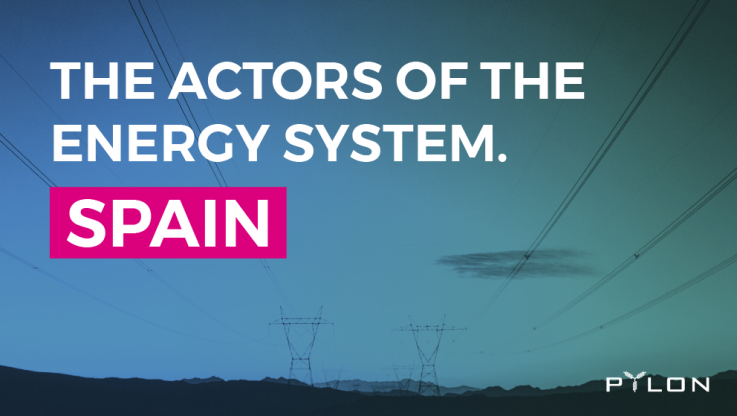 But back to the case of the Spanish electricity market and delve into the details of each of these actors. The producers are responsible for generating electricity, either for their own consumption or for third parties. At the same time, they are the ones who build, operate and maintain the production plants. There are different ways to produce electricity, from conventional thermal sources (coal, fuel, nuclear, combined cycle) to the most environmentally friendly technologies, called alternative or renewable energies (solar, wind, … ). The operator of the market is the one that manages the auction system for purchase and sale of energy in the daily and intraday market. The market operator in Spain is called OMIE. Participation in the market is achieved through an online platform, enabling the participation of multiple agents and the management of large quantities of offers to buy and sell electricity in a short period of time. OMIE also performs the billing and liquidation of the energy that is purchased and sold. Sellers make sales offers (supply), while buyers make purchase offers (demand). The market accommodates both and obtains a price per MWh common for all of the energy. After the first matching of supply and demand, the system operators (explained in following sections) re-adjust the final price according to the technical constraints, to obtain a viable daily program. These restrictions are due to complex offers, which can vary depending on grid congestion, generation zones, network load … Resolving these congestions caused by the limitations of the transmission and distribution network, planned over for the next day, as well as those that arise in real time, comes with an extra cost that is added on the established price from the previous market clearance. The final match would be corrected in the following way. In one of our past posts – The Energy Mix and how the price of electricity is determined – we explained in more detail how the market clearance in the electricity pool is carried out and how the price of energy is established. See post here. Red Eléctrica de España (REE) is the company dedicated to the transmission of electricity and the operation of the transmission electrical system (the national grid). It is responsible for ensuring grid security and for managing energy flows ensuring its operation without interruptions, continuously coordinating production and transmission according to instantaneous demand. Transport networks, as a rule, have a voltage higher than 220 kV (“High voltage”). The legislation establishes a single carrier, which is REE. Transmission networks are a natural monopoly, so the legislation states that anyone can use them by paying a usage tariff (established by the State). They have the function of distributing electrical energy, which means that Distributors are responsible for expanding, maintaining and operating the distribution networks, designed to transfer the energy to the final consumers. Generally, the distribution networks operate in voltages below 220 kV. As with system operators, this activity constitutes a natural monopoly – new distribution lines are not to be built in territories where another distributor has already done so, but any actors (i.e. marketers – see next section) can use them to distribute electricity to the final consumer, by paying a distribution tariff. 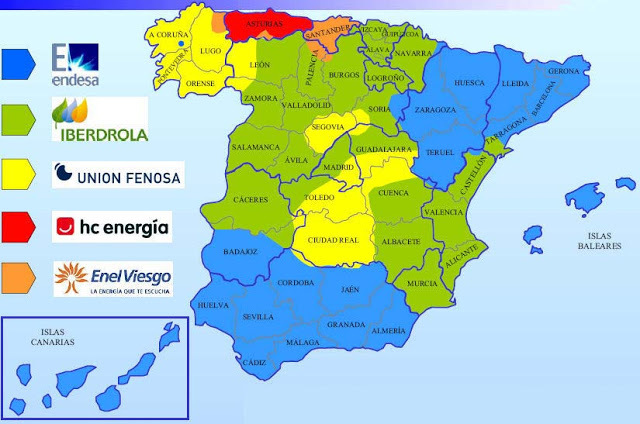 The following picture shows the jurisdiction territories of each distribution company in Spain. – Expand the network according to new demands for electricity supply. – Ensure an adequate level of quality of service (i.e. stable frequency and avoid black-outs). – Do not set barriers for entry, regarding access and connection to all players. – Measure the final consumption (i.e. set the bill). – Apply tolls or access fees to consumers (distribution tariffs). – Maintain the database of supply points updated and be able to control in real-time. – Inform the agents and customers involved. – Present annually their investment plans to the boards of the regional Autonomous Communities (e.g. the Basque region, Catalan region etc.). The function of a marketer that operates in a free market is to supply electricity to participating consumers; that is, to those who have freely chosen their marketer and agreed to a set of contract conditions. The marketer (utility) is the energy actor that sends the bill to the final consumer (you!) and what most people don’t know about their electricity bill, is that it includes, not only the price of the electricity consumed but also, the tariff (tolls) for using the electricity networks of the system operator (“high voltage”) and the distributor (“low voltage”). With the liberalization of the electricity supply markets, all customers can freely enter into contracts with any marketer, which will include commercial clauses (prices, payment terms, etc.) negotiated by both parties. Small customers (powers under 10 kW) can benefit from the so-called “Voluntary Price for Small Consumers” (PVPC). This price is calculated based on the average hourly electricity prices weighted by the customer’s consumption. They do not have a fixed price, but vary each month depending on the behavior of the market. Additionally, the cost of the System Adjustment Services is added. This case would be through a “Reference Marketer“, which operates outside the free market. More details on the energy utility market conditions and the ability to choose your own electricity provider, can be found in our previous blog post, here. – To use the power lines owned by the distributor of the area and deliver electricity to their final customers by paying the tariff for the use of the network (a payment regulated by the Administration, known as ATR or toll). – To set the electricity rates of its customers and agree on certain services by contract. – To bill for all the services & intermediaries of the supply chain: as mentioned before, distribution and transmission tariffs, as well as, contracted power capacity, consumed energy, electricity tax and meter rental (unless you own it). – Are not responsible for the supply (responsibility of the system operator). – Buy the energy they sell to their customers in the wholesale market. – Inform other market players in advance about the energy they have bought for (and will supply to) their customers. – Settle with the Operators -OS and OM- the purchase of energy and all the stages included. – Manage the High and Low Clients with the Distributors. – Pay the tariffs/tolls to the distributors. These are the main players in the current Spanish electricity market. In future publications we will talk about a new agent that will become very relevant in the near future and will play a very important role in the current market operation – this is the demand aggregator: a player that can aggregate in real-time the energy assets of other (small or big agents) to offer grid services in future markets with huge potential. With the digitization of the energy sector the aggregators can offer market access to small players – for example, consumers, self-consumers, mini-producers, prosumers, batteries, charging points for electric vehicles, or any combination thereof – to act as a single entity and participate in the electricity market (both wholesale and retail) or sell services to the system operator. Exciting, right? Do not miss it and stay updated through the following communication channels.